Forget the fine china and small appliances! Newlyweds also need gardening supplies! How about a watering can, pruners, planters, a shovel, a rake, maybe a wheelbarrow? 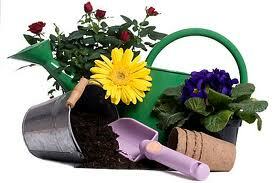 While you are at it CHECK OUT WAYSIDE GARDENS to order them some pretty plants for their yard or yours!